Terroir: Minervois is one of the great appellations of southern France. Situated on the rugged hillsides soaking up the warm Mediterranean sun, the region produces wines of combined elegance and power. This Minervois is sourced from the dry area of Les Mourels and Les Coteaux which extends from Caunes to Aignes, where the wines on slopes grow hand in hand along with the garrigue on sandstone soils, less sensitive to dryness. In the western village of Caunes, Syrah are planted on cooler places which take advantage of the first oceanic influences. Growing on limestone clay soils, Syrah is able to withstand to a dry year thanks to the clayey subsoil water retention capacity. 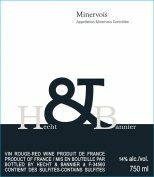 Vinification: The Hecht et Bannier Minervois is a blend of Syrah, Grenache and a touch of Carignan vinified in a combination of concrete tank, large neutral oak cask and oak barrels. "A hefty red, with dried red berry, olive and earthy notes, marked by dried herb and licorice accents. Ferrous mineral, cured meat and spice details fill the chewy finish. Syrah, Grenache, Mourvèdre and Carignan. Best after 2021."